Are any of those 6000 already taking path to the 62 bus? If so you’re already getting their fare, so you’d have an even lower fare recovery ratio for the extension. Why won’t they put in another stop? Is this financed with airport transportation fees? I believe they plan on financing a portion of it with Passenger Facility Charges, and there are federal restrictions preventing PFC money being spent on anything not related to the airport (i.e. providing service to South Newark). Are they allowed to finance an infill station with a separate pot of money as part of this project? Ten years out after the extension to the monorail is completed? I’m personally not sure – but I think so… That would be the best way anyhow. Poo that. It’s really unlikely the demand for a bus-train trip is the same as the demand for a train-monorail trip. It’s a lazy way to model use. If service improves, more ridership will be attracted. The only thing that can worsen farebox recovery intolerably here is the retardedly high capital expense. That said, it’s unlikely to improve demand *enough*. Airports literally never seem to have much demand, actually. They’re attractive enough that they can be stops on a line that has other uses. It’s gonna be at the storage yard they need to run 10 car trains on the Newark-World Trade Center line…. I’m really not sure who this project is supposed to serve and how much it is supposed to help them. Is transferring from PATH to a NEC train at Newark Penn that hard? In a civilized country they could time the transfer to reduce the penalty, at basically zero cost. If this was going to have any value, as you said, it would be to serve the airport directly. In that case, they’d probably get people transferring FROM the NEC at Newark Penn. This smells like institutional silo thinking to me (the same thinking that sliced up New York Penn Station into 3 tiny stations), where “the PA train must serve the PA airport”. All of the Jersey City hotels charge the same as Manhattan hotels. You don’t save anything by going across the river. The people looking for a cheap hotel room stay at the airport and use the train to get into Manhattan. Or at a hotel near a train station. Whether that’s a train from Queens or a train from New Jersey. Changing trains to NJT Rail at Newark is not difficult, but train frequencies are definitely lacking, especially on weekends when all of the trains have to be clustered together so they can run in only one tube of the North River Tunnels. And it’s also quite expensive (beyond the fact that NJT fares are pretty expensive for discretionary travelers to start). Not having intermediate stations is the biggest mistake IMO. The PA knows that it’s service is helping redevelop Jersey City (and to some extent Hoboken). Would do wonders for Newark. Alas, the PA isn’t actually in the rapid transit business and the PATH has always been an afterthought for them (or rather an orphan child they took in to build the original WTC). It’s a major regional asset that just isn’t living up to it’s potential with it’s current owner. Isn’t it easy enough for the intermediary people just to take a taxi a couple of miles over to the airport? I don’t really have skin in the game one way or another, but if the point of building it is to appeal to Manhattan air travelers, I can see why they’d want that trip to be as express as possible back into the city – especially given all of the time taken up by the AirTrain. An intermediary station would connect them to the rest of the path line, not just the airport. an intermediate station would have to hover over a very busy highway. Which wouldn’t be cheap. And which wouldn’t have many riders. So Vansh….what would you do to make PATH a more valuable regional asset? Would you extend it from its’ current WTC terminus to say Hanover Square to meet the 2nd Ave line? Yes the airport extension makes sense, but not at that price. I would extend the #7 train to connect with the PATH’s northern crossing. Although a long ride, it would give direct service to Newark from important sections of Queens and Midtown Manhattan. This would appeal to the budget traveller and to some airport employees. **Abandoned the Path’s 6th avenue alignment (use as a high priced indoor train yard) and use the northern tubes to connect with the #7 on the west side with trains continuing out to flushing giving east side access and connections to all lines at 42nd Street. In NJ I would split the line with half going out to Newark and half going out to the secaucus transfer station. I would likewise have the downtown Path abandon the current Hoboken station to run to Secaucus. (All non-Penn Station NJT trains would terminate in secaucus. I believe that alignment would produce a healthier transportation network. Whether the Path becomes part of the MTA or the #7 becomes part of Path (free transfers maintained) do not really matter. What is the ridership of the 33rd st PATH to station below 33rd street. What portion of riders have final destinations of 40th Street and north? I wonder if it would be more financially reasonable to extend the AirTrain to Newark Penn Station, instead of PATH to the airport train station. Of course, extending AirTrain to downtown Newark would negate the entire investment in the airport train station, and possibly run into capacity issues for the AirTrain people mover system itself. Agreed, this is a better idea. To solve the capacity issues you’d just have to buy a few more trains. Not a big deal. The people mover is also getting up there in years, and keep in mind that it will become due for replacement sometime soon. The most idea solution would be to just have the PATH extension kill two birds with one stone and extend that to the Airport terminals. If that will not be possible, then an AirTrain JFK-style people mover that’s a bit quicker and goes to Newark Penn is a nice idea. Extending PATH to the terminals probably isn’t possible due to the curvature of the terminal area (impossible to have a station at every terminal) and the physical size of the terminal area (too big to have one station serving all terminals). An upgraded people-mover to Newark Penn makes a lot of sense though. It allows access to the NJT/Amtrak trains that don’t stop at the airport (and for good reasons not all of them should stop at the airport), as well as Newark light rail and other transit services. 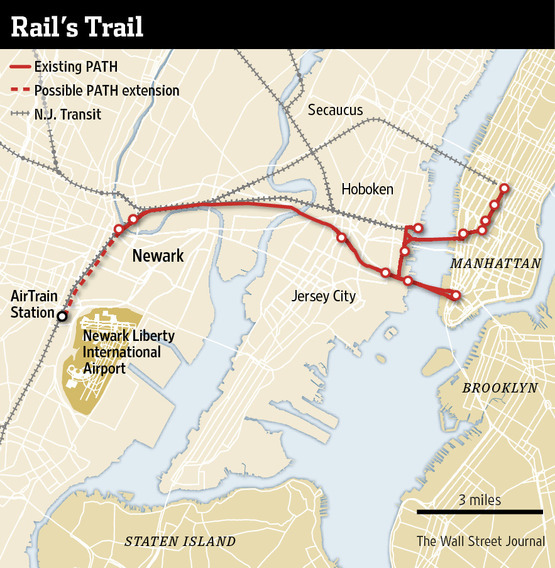 The PATH train direct to Newark Airport is to enhance the World Trade Center! Once that is fully understood, everything else falls into place! The ideas about putting in another train stop, etc – has to be looked from the perspective of the business folk that this extension is catered to. They are not going to take the #62 bus, or any some stuff transit. Do not even think along those terms. To fully understand this project, you must think in terms of how this project enhances the World Trade Center. From that perspective everything about the project makes sense. Those same items may not make sense when viewed from other perspective, but those perspectives don’t hold much weight when it comes building and enhancing a project meant for the business class. Something something unwashed masses something something needs of the business class something something blah blah blah. Really, it’s this logic that offends me most of all. To say nothing of how problematic it is that we’re apparently no longer capable of building transit for those “dirty poors,” New York City is one of the few places where right now we are very close to the ideal of a place where people of all statures and classes use mass transit – public transportation in the truest sense of the word. It’s this argument that has me opposing the PATH extension more than any other argument. Even the absurd cost is justifiable if you learn to stop worrying and love the cost overrun, because $1.5bn isn’t any more unreasonable than any other clown show expenditure proposal you can put this thing up against when all of them cost 5 times what they ought to anyway. No, the cost doesn’t matter, and the limited ridership is solvable. The real problem with this project is the FUD about “POORS” that you try very hard to dress up in terms of what “respectable people” expect this project to be. Sorry Ryan – but NYC competes with Hong Kong and London…. There is not question of the need for direct airport – transit connections. If NYC was never the city of so much wealth 100 years ago – we would not have the transit system we have in the first place. That’s just reality. Droves have come and stayed in NYC because it’s been the economic engine of the country for over a century. That’s why the poor come here… Like my family did. I frankly think EWR is a blight upon this region, this country, and the world. As an airport it is outmoded, outpositioned and outdated. If we’re investing any money into the airport for the sole purpose of sheltering the affluent from the horrors of Newark, then that money is better spent tearing down the terminals and rebuilding the entire damn thing over the corridor. Forget the AirTrain – the best air-to-rail transfer is an elevator from Track Level to Arrivals Level to Departures Level, as needed. Failing that, the mandate to provide a transit connection here is already met by the aforementioned AirTrain and that mandate is also to connect the airport to its region of service – not to ferry people afraid of “the wrong sort” high over poor disenfranchised communities on their way into Wall Street. No service, no service. This thing should either be built with a station in South Newark or not built at all. What kind of origin or destination is there at South Street that makes it worthwhile to spend a few hundred million to build a station? There used to be a station there that had direct service on what we now call Northeast Corridor trains. It closed for lack of use. When there were a lot more people living around it. NJ Transit bus is particularly of an offensive transit system. Zoned fares. Exact change only, no fare media in 2014. If the NJT bus driver doesn’t like you or thinks you need to “stay out” of the area, he will stop the bus, call you out, and make you pay again for the next zone when you already paid for 2 or 3 zones. NJT bus had NO MAPS until 2014. They DO NOT want non-local passengers to ever take the bus. Half the NJT Bus system still has no maps. The routes are insane with part time detours and branches, rush hour only stops, and routes that run 2 or 3 times a day. Try reading a NJT Bus timetable route diagram. You won’t be able to ride the system. NYCT Bus is a private jet compared to NJT Bus. Also NJT bus prohibits luggage. NYCT/Path dont. Silly silly driver making you pay for the fourth zone when you only paid for three. Silly silly bus lines going to where people want to go instead of being neat and tidy. Most people who ride the bus use a monthly. How many decades would it take to recoup the cost of ticket vending machine at bus stops where 5 people a day want to pay cash? Due to Federal rules any system built using airport money ,called Passenger Facility Charges (PFCs) such as the JFK AirTrain and EWR AirTrain can not connect to an existing rail system. A PATH extension to EWR would be prohibited from direct connection to EWR. The only way a direct connection is possible is if the feds are reimbursed for their PFC money –with interest. LaGuardia would have the same problem unless PFC money is not used. Incorrect. They can connect to existing rail systems as long as they do not provide improved service for non-airport passengers. The Portland and St Louis light rail systems built airport stations with PFCs, for example. If that’s the case, then that infinitely makes a subway connection to LGA more difficult. Granted, this is a tangent, but it’s not entirely unrelated due to being in a relatively similar vein. It makes an Astoria Line connection harder. It wouldn’t have any effect on a branch of the 7 subway or Port Washington LIRR, as those would presumably not have any intermediate stops. How would a branch for either of those be practical? Paying premium fare for LIRR just to reach the airport is insane — especially if a separate fare was already charged. A branch for the Flushing Line is only somewhat practical if the branch involves Manhattan; however, Corona Yard is east of 111 Street. Either of those connections would be significantly out-of-the-way, whereas the Astoria Line could simply have it tacked on without much consequence. Branching the 7 means cutting service to the busiest subway station outside Manhattan. a subway to LGA would have to be an MTA project (as was the case with the proposal during the Guiliani admin)… The PA could only do an “Airtrain” style rail link. Mr. Eric is correct. The restrictions that come with the PEC’s would not prohibit them from extending it right to the terminals, but it would prevent them from adding any additional intermediate stops in Newark. This is just another example of the problem of there being no central authority looking at the big picture and public interest for infrastructure projects in the greater NY metro area. PFC money is limited to direct airport improvement. The PA wants to focus on integrating their various properties. But there’s no one thinking about the overall experience of the transit rider and thinking: what’s the most efficient way to get people to EWR airport. Replacing the Newark Airtrain with PATH and eliminating that one transfer would make the experience of travelling to Newark somewhat less annoying than it is now. Extending PATH directly to the terminals would make EWR the only airport with one-seat ride from the terminal into lower Manhattan, as opposed to a two-transfer trip (Subway or PATH to NJT to Airtrain.) Sure, it’s not as futuristic as a monorail, but it makes travel to the airport far more convenient for travelers coming to/from lower Manhattan and Jersey City by eliminating two transfers (PATH->NJT and NJT->Airtrain). It would make EWR the only airport to have a one-seat ride into lower Manhattan. And as annoying as EWR is to get to/from by train (especially if you just miss a weekend train and are stuck waiting at the Airtrain station for 50 minutes), it’s still better by mass transit than LGA. Building stations under three busy terminals wouldn’t be cheap. Airtrain isn’t just to get people to the train station. It would still need to be there to ferry people to the parking lots and shuttle buses. If you’ve been to Newark Airport recently you may have noticed that parking under the terminal is now prohibited post-9/11 to prevent truck bombing. A rail station for passengers with pre-screened luggage wouldn’t be a problem, utilizing wasted space. You may have noticed to get to the parking lots one has to cross many lanes of cars, taxis, limos and buses. Putting 6 grade crossings into that traffic wouldn’t be particularly good. So it either has to be elevated or in a tunnel. Elevating it means arranging support over the traffic. It’s not gonna be cheap to do that three times. Unless they do it three times it’s not all that much different than changing to Airtrain at the existing station except for the people lucky enough to have a flight in or out of the terminal with a PATH station. What about having one station in the middle of the airport (under Terminal B parking) and then have tunnels with moving sidewalks to each of the 3 terminals. Would be much less expensive than 3 separate stations and would be no further of a walk than from check-in to the end of any of the Terminal C concourses. How much cheaper is a tunnel with a moving walkway in it compared to one with a train in it? Okay, so according to current projections it’s $250,000 per rider. Stick a fork in it and move on. There are enough $25,000/rider projects out there. I want to ask you a serious question and I’m hoping for a serious answer. B) That sticking a fork in it and moving on is liable to free up the money for the list of projects that you believe in, or that I believe in, or that Ben Kabak believes in; and the money won’t simply find its way to Charlotte or Detroit or Tampa or Vegas or any one of a hundred other cities or just disappear down the memory hole? Because I don’t believe A and I consider B highly unlikely. Provided A is false, then this project – while indeed a joke at $600m/km – should be measured against other projects that are “supposed” to cost $100m~150m per km, because that entire list of projects is going to suffer the exact same kind of cost balloon. And, provided B is false, then this project should be judged on its own merits and completely blind to what the money “could” be spent on otherwise because it’s my humble opinion that if not spent here, the money just evaporates. That having been said, I am opposed to this project in its present form. Its problems are solvable and it can be adjusted to serve better end goals, but if there is no change, then I would rather see the funding sent down the memory hole than wasted on this. Just don’t fool yourself into thinking it’s going to turn into 10% of a tunnel, because it won’t. Agreed. Public money ‘saved’ by not doing X rarely means that this money will then go better public-works option Y, and certainly not in in the bizarro world of PA & MTA & NJ state & NY state & city & US federal mass-transit spending. Politics is the ultimate driver here, and investment in improved Newark Airport transportation connections could spur rather than lessen public support for rail links to LaGuardia. The PATH extension plan could be improved, unquesionably, or maybe transformed into a long-term upgrade of the Newark people mover. But to kill the plan outright seems short-sighted. As Voltaire reminded us, the perfect is the enemy of the good – and he never rode an Air Train, a PATH train, an A train, or even the Paris metro. Seeing as how the money for this proposal would be coming from local sources, it’s highly unlikely it will end up in any of the aforementioned places. ARC never had any cost overruns. It got canceled when the Guverator lied about how much it may or may not have cost. The FTA and NJTransit were predicting 9 to 11 billion with a possibility of 12. Instead we are going to build Gateway which will cost more, take longer to build and have less capacity. Ugh, I wasn’t checking blog comments as often as I should have. I think A and B are both partly true. Ad A, nearly all projects in New York are extremely overpriced, but occasionally there are exceptions (i.e. the JFK and Newark AirTrains were only somewhat overpriced). Moreover, I think that there’s a vast range of cost-effectiveness, as opposed to cost: Second Avenue Subway, expensive as it is, has such a great benefit that its cost/benefit ratio is only in the “higher than I’d like” basket, which makes it better than most American projects. I also think that absolute costs are a bigger problem than cost overruns, i.e. costs relative to budget: SAS and the 7 extension have both exhibited mild overruns, unlike the huge overruns of ESA and ARC, but their absolute costs remain the worst in the world, higher than 3-times-over-budget boondoggles in Europe, whose budget was initially very low. Ad B, the cost per rider of this is so high that the average Tampa or Charlotte project that would use the same FAA money is going to be a better use of money, probably much better. Not all airport connectors are bad, although sadly, the most useful potential connector in the US, LAX-Union Station, is being made much more difficult to build as we speak, as the right-of-way is being given to a mediocre light rail line. (It also might not even be eligible for FAA funding, since the right way to do it is to provide plenty of local neighborhood stops.) Locally it’s more difficult: there are worthy transit investments in North Jersey, but none that anyone is thinking about, including a subway under Bergenline, an extension of the C across the GWB over Route 4, and ARC done right. However, remember that the money doesn’t belong to public transit by divine right. At $250,000 per rider, the utility is so low that the state has better uses for the money far from transportation. The Abbott Districts could use that money for schools. Denver has funded and is currently building an ***electrified*** commuter rail system the size of Metro North. Good luck building anything in the tri-state area. Wikipedia says Denver is planning 122 route miles. Some of it light rail, some of it diesel commuter and some of it electric commuter. Wikipedia says Metro North has 385 route miles. Most of it electric. Lots of it three or four tracks. I’m always confused when people compare systems being built from scratch with legacy systems being expanded. As big as Metro North? Well that’s great for Denver (though there will be far less stations)… But Metro North already exists – so why would the NY metro area need to build another? That’s not counting LIRR and NJ Transit commuter trains. What would it cost to extend the AirTrain to Newark Penn? If it’s cheaper, it’s the no-brainer replacement project. It is probably not worth it. The only way I would get behind this is if they created an intermediate station in South Newark, which could be both a commuter station and help with redevelopment. In 100 years Staten Island will have service! If you took the extension of PATH as a given, but could choose any route, which route would give you the most ridership? Certainly not to the airport. The Airtrain/NJT connection is not perfect, but it’s really already fine. Laguardia is the airport that needs something more. And even that one deserves lower priority than a lot of other potential projects in New York. The obvious choices are PATH to Secaucus or the 9 St PATH extension to Astor Place (and then to Alphabet City). More exotic choices exist uptown or towards SI via NJ, but those are the obvious two. I personally would prefer to see the discussion move towards folding path into the MTA as an expansion of the A division, however. That would be a costly folding project. I agree, Ryan. The PATH train system should be subsumed into the MTA subways. I’d run it as a C Division, however. And I’d like to see it run out of the 9th St. PATH extension up to Union Square rather than Astor Pl, if for no other reason than the greater connectivity offers more bang for the buck, and the tunneling distance is the same. Also if it went south from Jersey City – through Bayonne – on to Staten Island…. But that would make too much sense – lol. The people who are using it to get to the World Trade Center and 33rd Street will be really annoyed when they have to hang off the sides of the less frequent trains so that trains can run to different destinations. I’m not sure that you could ever unify the A and B Divisions without essentially gutting the system and rebuilding it (either to lengthen platforms in the shift to universally longer and narrower A division trains on the B division, or to make up for narrowing platforms to accommodate wider B division trains on the A division), which frankly isn’t worth the trouble. By contrast, right now the hypothetical C Division is using rolling stock virtually identical to that of the A Division – they’re on 600V third rail instead of the A Division’s 625V and the cars are 192 mm wider, but that’s more or less the extent of the differences between your typical PATH car and the R142As. It’s a matter of widening platforms to accommodate that ~7.55 inch difference in rolling stock width, and with half of that difference going to the non-platform-facing side you basically need a little under 4 inches of extra width on the PATH platforms. Get that and solve the voltage difference, and you’ve seamlessly integrated PATH into the A Division with few to no complications. As for running it up to Union Sq – I honestly don’t see the benefit. Assuming you build out Astor Pl in such a way that the PATH platform bridges between the 8 St – NYU station and the existing Astor Pl station, you get everything you have at Union Sq except the L (which is already connected to PATH at 6 Av) and the express tracks (which aren’t a tremendous loss since we want to somewhat encourage more load distribution away from the express trains and there’s cross-platform transfers anyway). By contrast, running it along 9 St, you can get a potential future 2 Av transfer, properly serve Alphabet City in a way that’s impossible on current lines (an Avenue C stop on the L is impossible and a stop at Tompkins Square better serves the neighborhood anyway), and potentially soak up some of the crosstown traffic currently using the L. Depending on how you build it, you could leave the provisional door open for another extension into Williamsburg later on. There comes a point where the economies of scale have diminishing returns. In nice round numbers the NYC subway has 8.7 million riders a day and the next busiest system is the DC metro at 0.85. Yes, less than one tenth of the NYC ridership. The Lexington Ave. lines have more ridership. Reseparate the IRT, IND and BMT they would be the country’s first second and third largest systems. PATH is the country’s 7th busiest system. They already have cut back the tunnels in places to fit the trains. Make them any wider and the tunnels have to be redug. The major difference would be the managing director of PATH reporting to the MTA instead of the Port Authority. Cut back the platforms on the IRT so IND/BMT cars can stop at the station they bang into the tunnel walls. It’s why there are shorter cars running on the J/Z. It’s not worth it to merge them all…. Makes me wonder what the ridership is on the J/Z. Country’s tenth largest system? The voltages on the system are nominal voltages. They will be higher near substations off peak and lower far away from substations during peak. The difference between 600 and 625 doesn’t matter. …The electricity at your wall socket can be 110 volts when you have the air conditioner on during a brownout and 125 in the dead of night in the spring and fall. That doesn’t matter much either. Wikipedia disagrees and links to the APTA report where they got the numbers. The MTA says it’s 5.4 million. APTA reports unlinked trip counts. So if you ride from the Upper West Side to Forest Hills, switching from the 1 to the B/D and then to the E, your trip counts three times. 4.7 million per average day, not average weekday. Still, 5.4 million is nowhere near the number you apparently pulled out of your arse. I got the 8 million and 8 hundred thousand figure from Wikipedia. I have better things to do than wander multiple websites or wade through APTA reports. Hey, if you’re gonna support your arguments with incorrect numbers, don’t be mad if people correct them. Not broken out by mode, but NYCTA is listed by NTD as having over 10 million daily unlinked trips. So you’re saying taking the PATH to the 6 so that you can take the 6 to the 4/5 makes more sense than taking the PATH directly to the 4/5/6 ?? And that makes sense to you? Of course bridging the NYU and Astor Pl stations makes perfect sense if you’re running along 8th Street. So does availing ourselves of the large and already available nexus which is Union Square. I’d continue to run it up from Union Square to 23rd and 2nd Ave, where there is already a station planned, essentially continuing the same diagonal from Christopher St through 9th. There is no SAS station planned at 2nd and 8th/9th, and land acquisition and station building would be a major added expense. Admittedly, serving the East Village has merit. OR … if extension into the outer boroughs makes sense, then running from 2nd & 23rd out to Greenpoint Ave on the G Line could have merit too. Or course the devil is in the details, and one project proposal might turn out to have vastly better engineering options – or vastly worse engineering obstacles – than the other. But it’s fun to think about the possibilities. Regarding the pesky detail, many of the people running up to 33rd are doing it just to connect with another subway – the L at 14th, the N/Q/R at 33rd, … or just walking cross town to their jobs on the east side. Splitting the service would give half of them a better option, one that just as easily connects at Union Square for east side access. As for the WTC bound people, it would have zero impact on them. Not so pesky at all. Yes they change to the subway at Herald Square to get to Grand Central. Times Square too. Rockefeller Center. Or to 63rd and Lex. Or 53rd and 5th or 53rd and Lex. Columbus Circle. A few to Long Island City and farther reaches of the Upper West Side and Upper East Side. What’s the significant difference between getting to Union Square by changing to the L at 14th and 6th versus changing to the 6 at Astor Place? They wouldn’t be doing it to take the 6 to Brooklyn Bridge to get to the City Hall area. It would be faster to take a train to the World Trade Center and walk. Or Brooklyn. It would be faster to go to the World Trade Center and walk to the 4 or 5. Or the A or the N or the R or the J or…. We’d be building this because it would induce hordes of new passengers. It would need a deep cavern station at Grand Central and at Astor Pl. There isn’t enough capacity on the Flushing line or the Lex. local tracks to finagle something. If it’s not going to be hordes of new passengers it’s not worth it to spend the money to make a few thousand people’s commute a few minutes faster. It does affect the service to the World Trade Center. The people who use the train to get from Journal Square or Grove St. to the Uptown stations have to use the same track as the people going to the World Trade Center. Which is so overcrowded that running every 3 to 5 minutes isn’t good enough and the PA is spending a lot of money to extend platforms for 10 car trains. Unless you want to rebuild everything along 6th Ave. There are those pesky IND trains surrounding it, they are stuck with 8 car trains at the uptown stations ya can’t squeeze more people onto each train by lengthening them. Optimistically it would open in 2030 or 2040. By 2030 or 2040 ridership on suburban trains to Newark, where people change to the WTC line will have eaten up the capacity on 10 car PATH trains. And the capacity East Side Access freed up at Penn Station with intercity riders, Metro North riders and the new riders on the LIRR. Which do you want a deep cavern station at Grand Central for the people who use PATH or a deep cavern station downtown for people who use PATH from Hoboken and Newark and LIRR passengers who passed thorough Jamaica? Fuzzy side of Velcro on the trains and the loop side of Velcro on their hannging-off-train vest? Or stacking them like firewood inside the trains? Well it seems the new commission recommended – and the governor’s agree – to stop PATH running from 1am to 5am… So it seems we are going even further away from integration. When I fly into Newark I usually do the 62 and PATH thing. Considering the fact that I usually travel to Lower Manhattan, so it’s easier to take a 62 rather than an unreliable Airtrain (literally spent 2 hours on it one night because the computers were messing up and randomly driving the trains around) to a randomly scheduled NJT train (really it should be 10-15 min clockface times all day) then to the Subway. The 62 is a decent bus route, but could use low-floor buses to help travelers with bags. Unfortunately, NJT decided to replace their entire bus fleet with high-floor buses a few years ago. Maybe they could install bus lanes on Broad St in Newark as well. It’s pretty frequent, runs 24 hours, and is only $1.50 so there isn’t too much to grumble about. PATH is decent too, except during owl hours when the schedule has a strange 35 min frequency. The unforgivable mark on PATH is the seemingly inability to time connections between the Midtown and WTC lines at Journal Square. As for an airport PATH extension, it’s not really worth the money. What needs to be done is rip down that excuse for transit called Airtrain and rebuild it. Run NJT Airport service every 10 minutes between Penn and EWR. Have a timed connection to PATH and consider a cross-platform transfer at Newark Penn. Integrate regional fares, so that travelers can use one ticket on NJT, PATH, NYCT, MNR, LIRR, etc. The problems with transit in the NY region (and especially in this Newark case) are organizational. A lot of these problems are easily solved. Unfortunately, they don’t come with ribbon cutting events, so the pols aren’t interested. It can’t be every 10-15 minutes. They have the off peak schedules arranged so they can maintain service with one track open under the Hudson. This is just a “study” that’s being commissioned so far, right? Who’s to say that the study (which will take almost as long as construction, surprisingly) won’t recommend the PATH train running to all of the terminals rather than to the current station? Yes, it’s redundant to an existing line, but you could say that about pretty much every subway route in Manhattan. I do believe an extension is justified. I don’t believe the cost is realistic, and I anticipate the study will reveal that. Nobody wants another Calatrava debacle, so this time I suspect they’re setting the projected cost artificially high so they can look like heroes when it comes down. What I do wonder is if this cost includes the extension of the Grove Street station. Right now, that only accommodates eight cars, while the rest (including the under-construction Harrison Station) can hold ten. As I understand, there’s enough excavation at Grove to accommodate a two-car lengthening, but it would require some work to get the platforms in place and to relocate rooms that are currently at platform level. Manhattan subway routes are not redundant because, with few exceptions, they are full of passengers. PATH to the terminals+AirTrain would be nearly empty. Oh yes they do. The corrupt contractors who would get paid Calavatra-level costs want it, and so do their friends in the MTA. Many of those same contractors do the same work faster and for less money in other US and world cities. Evil contractors are not necessarily any part of the problem with NY construction costs. Bad unions, bad labor practice, bad labor laws, bad liability environment, too many interested parties, too few intelligent decision makers. The main problem with the current set up is cost and frequency of NJ Transit in off peak hours. Use Passenger Facility Charges to ensure 15 minute minimum frequencies 24/7 on NJ Transit EWR stations and further subsidize fares so they are $5-10 total fare between Midtown and Newark Airport – for Airport bound travelers only, and include free transfer to the PATH. Seems like the $1.5 billion would go a lot farther and could be put into effect almost immediately. PS: Looking at Google Maps, it’s not clear to me that the PATH extension would be at grade. With all the existing rail and highway infrastructure, looks like it would have to be elevated. Was ‘at-grade’ written in any official documents? Also, ridership is not the only reason to build transit. Getting to the airport has value over and beyond ridership. And because PFCs can only be applied to projects serving the airport, this $1.5 billion is not fungible and could not be used on a second Hudson tunnel, or another phase of the 2nd Ave Subway, or pretty much anything else. Also, isn’t a big chunk of the $1.5B price tag the construction of a garage and hotel – or some other accessory buildings? The actual construction cost of the “PATH” project was closer to $1B to $1.1B. The PA has to build tracks to the Airport. Since they are building tracks to the airport it makes sense to build a station at the Airtrain terminus. During peak hours they run trains every 6 minutes from Hoboken to the World Trade Center. That’s ten an hour. And every 3 to 5 minutes from Newark to the World Trade Center. That’s at least 12 an hour. Probably closer to 15 an hour. There are 22 or more trains an hour going through the downtown tubes and 20 an hour going through the uptown tubes. Which have to negoiate flying junctions build under the streets of Jersey City. Merging and diverging trains eachs capacity. Running more trains isn’t an option. Installation of a more sophisticated signal system may allow them to run more but not many more. Running more trains isn’t a solution to their capacity problems. They could run longer trains but then the trains wouldn’t fit in the stations. They rebuilt Exchange Place to accomodate longer trains while it was closed. They are rebuilding Harrison. Newark, Journal Square and the World Trade Center have platforms long enough. All they have to do is extend the platforms at Grove Street. Add two cars to an 8 car train and capacity increases 25%. As long as you have 25% more cars. They need someplace to store all the new cars. The only place is at Newark Airport. Has anybody noticed that there already is a rail connection between PATH and Newark/Liberty rail station? It runs through the Ironbound section, which could use a transit stop, and was once electrified by centenary. It seems a lot easier than extending the ROW from Penn. Sta. Newark. Conrail. It’s one of the major rail connections to the port. There is very little daytime through traffic on the line. Most of the activity is on he industrial tracks on the east side of the airport. Activity may already be restricted because of NEC on one end and the at grade crossing of PATH at other. It’s grade separated from the NEC and on the other side of the Passaic River from PATH. I don’t think there’s a good service pattern for such an extension. There are two routes to Lower Manhattan – the “red” (from Newark) and “green” (from Hoboken). To serve EWR via Ironbound, you have to add a third route to Lower Manhattan, in addition to the red and green. This would decrease frequencies and complicate operations on the red and/or green lines. Both Newark and Hoboken are much more heavily used destinations than EWR, so this does not seem justified. PATH to the airport is presumably designed to serve Lower Manhattan passengers (NJT should be faster to reach Midtown), so extending the “yellow” line from Journal Square to EWR via Ironbound would not be very useful. In contrast, the Port Authority’s current plan would just extend the red line, so it does not run into these problems. Your points are valid Eric. I was thinking extend the JSQ line and possibly via Hoboken. NWK to WTC is packed tight most of the day. A cross-platform xfer would still be at JSQ. The Newport and Chelsea hotels would be served that are not now by NJT to Penn. That plus the Ironbound redevelopment, like the new condos at Harrison, might justify the lower cost of electrifying the existing ROW instead of building elevated next to NEC. It’s a slow slog up 6th Ave. If you are in Newark it’s faster to go to Penn Station in New York and use the subway to get to places along 6th. Especially if your hotel is on 8th or 9th Ave.
Newark is busiest station in New Jersey. The people who take the bus to Journal Square making it the second busiest to go to New York don’t want to go to Newark. There are a few but they can change places with the people who use Newark to get to their jobs in Chelsea and Newport. The ROW halfway to the airport is electrified. That’s how they manage to store trains there. The other four tracks are being used by people going to Newark to change to PATH for the WTC, Jersey City and Chelsea from the suburbs. And Washington DC. #2 I agree with – but what in the metro area is not expensive? I agree that PATH should be extended to the Newark Airport Rail Station. While I also agree that, unlike JFK’s AirTrain, Newark’s AirTrain is slow, it’s better than a shuttle bus and perhaps the PA can look into speeding it up a bit. I also agree that the neighborhoods between downtown Newark and the airport badly need transit service, so I would certainly like the PA to include one or two intermediate stops. This is where interested members of the public need to call their respective Governors and demand that any PATH extension to the airport include intermediate stations. They have service most places dream about. The whole reason that the Port Authority is considering this project is because it’s an attempt to balance out spending at LGA and JFK airports with a NJ project. The relative merits or costs for this project are secondary. It had long been on the wish list to extend PATH, and this qualifies as a project. Never mind that there are other modes of transportation that run along the same right of way and duplicate service, but PATH would be a more direct trip from Lower Manhattan than switching trains at Newark Penn. Instead of rationalizing the service and doing something far more cost effective, like say building an AirTrain to LGA from the 7 or Jamaica, which would vastly improve mass transit to LGA that currently has only bus service, we get the proposed expansion of PATH. But since that’s spending in NY, Gov. Christie (or whoever else is governor in NJ) will oppose unless there’s equivalent spending in New Jersey. Projects like the Bayonne Bridge or Goethals bridge are bistate, so they get support, but a single-state project has to get balanced with projects in the other. Port Authority spending is also being send further afield to Stewart Airport and AC Airport, which is outside the agency’s original mandate. Newark is busier than LaGuardia. Manhattan residents and visitors are a small share of EWR passengers, a large share of LGA passengers. Will that change noticeably with better transit from Manhattan to EWR? Per rider better transit to LGA could easily be cheaper than to EWR, even though EWR serves ~ 30% more passengers. They come from the Upper East Side. Or are destined for the Upper East Side. They use taxis or limos and will use taxis or limos even if they lived right at the subway station that connected to the airport. Look at where LGA is. LaGuardia has higher domestic O&D traffic; if more than 35% of Newark’s international passengers are connecting to a domestic flight, then LaGuardia has higher overall O&D traffic. LaGuardia also has higher domestic O&D traffic than JFK, by the way, but JFK has way more international traffic to make up for that; JFK needs 43% of its international passengers to connect to be below LaGuardia overall. People who are at the airport to change planes don’t care what the cab fares are, if there are buses or a train station or how much the parking costs. Or how many car rental companies serve it or how close the hotel rooms are. This is not completely correct as airport congestion caused by people driving to the airport makes it slower for people taking ground transportation between terminals. Having people come to the airport by train frees up airport roadways for intra-airport movements. Having the intraterminal passengers get on a people mover, like they do at EWR and JFK, means they aren’t on the road. Newark and JFK have Airtrain, they don’t need to get on the road. Any airport that requires people to use on-street ground transportation to get between terminals deserves to be destroyed in a terrorist attack. If someone is at the airport to change planes they don’t care if their is a train, bus, taxi, gondola boat, funicular etc. They care if there are moving sidewalks, elevators and escalators but not much about what happens outside of the airport. I would love to see rail service extended to LaGuardia. Maybe one day…talk to elected officials and ask for it. Cuomo’s “airport competition” calls for plans to be presented in 2015… One of the priority aspects are for rail service to LA Guardia and “improved” rail service to JFK (not sure what that second one would entail). Unless the gov plans to roll over the NIMBY’s in Astoria – this might end up being another AirTrain.. Fine by me. The implementation of course will be at least a decade. IMHO, rather than extending the PATH at (greater) cost, it makes more sense to replace the (dinky) EWR AirTrain system with something more like the one at JFK, that runs at higher speed on actual rails, and extend this improved system north to Newark Penn. The current EWR AirTrain is a Disney ride that should be upgraded in any case, and wouldn’t there be a cost savings for an AirTrain extension vs. a PATH extension? I’m thinking of differences in loading, train length, structural engineering, operators required, etc. That way, whether you take NJT or PATH, it’s a simple two-seat ride with a single transfer (for everyone) at downtown, multi-modal Newark Penn (which would be improved and expanded). Granted, this plan makes the Liberty Rail station superfluous, but I would much rather have a one-seat ride from the terminal to a transfer (Newark Penn) where I have a number of options available anyway. Many many many of the 8 million people living in New Jersey live south of the airport and greatly appreciate that they don’t have to schlep to downtown Newark to change to Airtrain. Fair enough. I think you could maintain the NJT/Amtrak stop at Liberty Airport Rail Station, then, and still extend AT to Newark. The majority of people using Newark Airport are New Jerseyans. They do go places other than Manhattan. There are other ways to get to the airport. Buses, taxis, limos, there used to be scheduled helicopter service but that ended. Many MORE of the NJ residents would appreciate if their NJT and Amtrak trains didn’t have to make an extra stop at EWR. For the cost of this thing, you could run a continuous chain of Mercedes Sprinter van airport taxis from Manhattan Penn==>Newark Penn==> Airport Terminals (bypassing the NJ Airtrain) free to the passengers* and build an extra lane here and there to get them out of traffic. At least several decades of this operation would be covered by the startup costs alone, add the insane PATH operating costs an it may -never- be cheaper than paying for free taxi service. Of course the operation would hire taxi drivers, not union transit operators. Heck for a couple BILLION plus operating costs you could have a circulating loop of stretch limos and free service, but airport shuttles are more convenient with luggage. *but don’t make it free, or you’ll have a homeless shelter on wheels. Sounds great to people who travel by black car and bizjet. Building another lane under the Hudson for the exclusive use of airport limos wouldn’t be cheap. Make the XBL bidirectional 24/7, send airport buses instead of limos and build a new rail tunnel instead. The funding… Apparently this is mainly funds derived by airport fees… They couldn’t use the money legally for another rail tunnel. They could if the tunnel was JUST for airport trains… but that would be a giant waste of money. Even airport fees have to come from somewhere. … explore relocating the NEC main line north of 287 by diverting it east along 287 and then up the NewJersey Turnpike to the Lautenberg station and turning the current trackage over to PATH and/or #7 for lower cost frequent service…..while taking away direct NEC corridor access to newark and newark airport the trade off will be frequent reliable service to NYC at cheaper fares free of FRA regs. Finally maybe the real solution is a non FRA high speed passenger only rail line along I-95 from Washing DC to Lautenberg Station (or via a new tunnel Penn Station NYC). Such a line could be meglev of a french TGV+ but given the removal of 100+ freight cars the systems and trains could be far lighter saving energy and vehicle cost across the board to say nothing of being able to use already proven TGV product. What are the chances of converting the entire path system for nj transit rail operations? That would solve the need for a new pair of Hudson tunnels, which could cost 10 billion. Nj transit riders would have direct access to world trade center and 34st station without the need of any extra tunnels. PATH itself does not have a lot of excess capacity so while increasing the cost structure (fra compliance) you are not increasing capacity. Under the Hudson River you have 2 tracks to Penn Station + 2 sets of PATH tunnels = 6 tracks. These six tracks serve and area from Rockland County down to mid NJ far greater than the several mile north/south width of the Brooklyn/Queens/Nassua/Suffolk Long Island. Clearly more (and not just 2 tracks) capacity is needed across/under the Hudson and transfer PATH to NJT is not the solution. I believe the path Hudson tubes were built originally for large passenger trains, correct me if I’m wrong. I understand that there are a lot of tracks coming from Queens and Brooklyn, but a vast majority of those are exclusively for subway, with only 4 commuter tracks(present day) that are also shared with Amtrak. They were built for El cars which is more or less the same as IRT cars. Which was mainline commuter loading gauges a century ago. They are too small for anything other than subway cars. It wasn’t mainline gauge! The Hudson Tubes were specifically designed to be smaller than tunnels capable of carrying full-size steam trains. That’s why they carry IRT-size cars while the contemporary Park Avenue Tunnel and Penn Station access tunnels carry full-size mainline trains. Big chunks of what is now “subway” in Brooklyn was LIRR or one of their competitors at one time. The LIRR merrily ran trains all over the El in Brooklyn. Whether it was “subway” or “commuter” was much blurrier back then. It’s why the J/Z has to run shorter cars than the rest of the BMT and IND. We’ve been gnawing on these problems since the 60s. …which gave us the 63rd St. LIRR tunnels which have been sitting there gathering dust since 1972. The PRR Historical Society used to have webpages with cites of the original sources. They have evaporated into the ether. 32 tracks once ESA opens.